EARTH CAMP is based on sustainable living skills and nature connection. 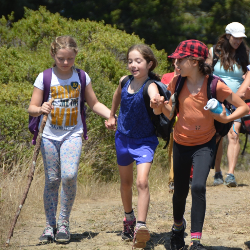 Each day has a specific theme in which the campers will learn and participate in adventures, skills, and experiences that will heighten their awareness of nature and the world around us. Some themes are: Earth, food, energy, air, shelter, water, web of life, and fire. garden projects, wild plant and animal hikes, tracking, nature wanders, bird language, tree climbing, fire making and other primitive skills, eco crafts, and special guests to name a few. Everyday we are found in the garden, playing with the chickens and goats, playing games and completing team building initiatives, crafting and so much more. Our special guests, elder stories, solar cooking, nature journals, tree climbing and wanders are among the campers favorites! We'll hope to see you here! Please check our website for more complete details and list of activities earthcamp.org on the new "About Earth Camp" page. "Coyote mentoring" is our goal, teaching kids while they have no idea they're being "taught" anything. The children think they're just experiencing the exhilaration of playing in natural settings, doing crafts & games & music, and stumbling over & over into the wonder & amazement of nature. That's why quality staff like ours is so critical in your choice of a camp for your child. Jamie Malone "Sunshine" is returning as director and lead mentor. She loves mentoring the students and finds summer camp her favorite time of year! Bev Buswell "Sequoia" is the owner, founder and director of Wildflowers Nature School. She is the visionary behind all the mentoring and nature connection that unfolds on her beautiful property. This summer she will stop in to share her enthusiasm, passion, and stories of mysteries found in nature. Farmer Buzz co-owner, farmer and mentor of the boys scout group will join us to share music. Buzz often pops in with unseen wonders, quiet mysteries, and incredible stories.